Description: Fan filter set 120 x 120. Description: Variety of fan guards from Essentra Components. 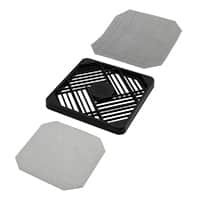 Description: This is a transistor insulator pad that provides electrical insulation. The length of this part is 1.13 in. It is made of gray silicone rubber and fiberglass composite.